It’s a fact that over 90% of households in the United States experience a power outage at least once a year. It’s important to be prepared for such an eventuality, but don’t let your preparations overlook an important aspect of your home: your garage. Not only is it the primary access point for a majority of households, but it also contains the heaviest moving object in your house – the door itself. 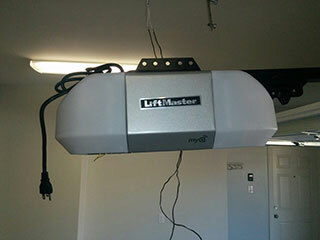 You’ll need to be able to manually lift your garage door in the event of a power outage. Set your opener to the appropriate “off” settings, or simply disconnect it from the power outlet, and then make sure you’re easily able to physically lift the door in a controlled manner. Safety and security go hand-in-hand. Since this is the primary means of accessing your house (a majority of residential homeowners use the front door less often than they do the garage), you’ll want it to be easy to use as well as secure, so that in the event of a sudden power outage you'll still be able to manually operate it. Many modern openers come with a battery backup mechanism that can allows the system to continue to function for a certain amount of time after it's main power source has been cut off. Most of the top brands such as Chamberlain and Liftmaster automatically include this option in their new openers. Even if your automatic system doesn't have a backup power option as part of its default setup, one can be simply added on. An external backup battery can be attached to your opener, along with an automated switch that makes it "kick-in" the moment the main unit loses power. In addition to making sure your system is ready for a possible power outage, be sure to stock up on bottled water and nonperishable food, as well as batteries, matches, candles, etc. It’s also important to have a ready supply of first aid kits. Flashlights are essential too. In fact, a ‘power outage survival bag’ is a great thing to store in your garage! That way, you’ll be doubly prepared for anything. Just grab the bag, and secure the door.